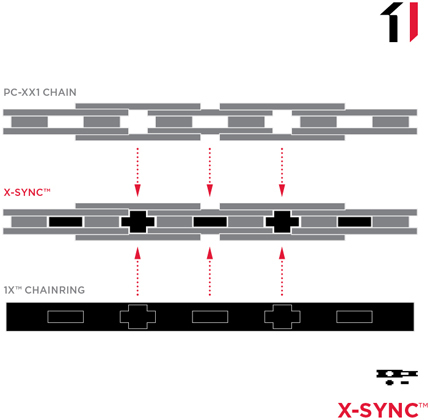 The SRAM X1 11 Speed X-Sync Chain continues SRAM's line of durable, dependable, light weight chains. Add SRAM's XX1 geometry and you can be confident of smooth consistent shifting on every ride. SRAM chain engineers developed PowerLock as a tool free, sure and consistent way to connect our 11 speed chains. While PL does not require special tools for install, the especially tight tolerances of 11 Speed drive trains mandated that each PowerLock is good for a one-time application only. SRAM X1 11 Speed Chain is rated 4.2 out of 5 by 5. Rated 5 out of 5 by Ole73 from Shifts great I haven't thrown my chain on my 1x setup yet. Shifts great. I can't speak for durability yet. Rated 5 out of 5 by mikejb52 from Good cheap chain Chain is cheap enough to be able to change chain at regular intervals to save Wear on rear cassette had 4 chains on latest cassette and no problems with any of them good value for money. Rated 5 out of 5 by KikasSousa from Best 11v Chain for MTB For me the best quality and price chain for MTB, I don't need to test more! Hi. Will this fit an ultegra 11 speed cassette - as you have no ultegra chains in stock? It is not advise to use Sram 11 speed chains on Shimano drivetrains I'm afraid. do you sell the links for this chain? This is not something that we have from stock I am afraid. The front page for this item states the chain length to be 118 links but on the detailed description tab the length is stated as 114 links. Can you please confirm if this chains length is 114 links or 118 links. Thank you. This chain is 114 links. Will this chain work on a cyclocross bike with road shifters and mechs? This will work with SRAM X1 11 Speed setups only. I can advise that 11 speed Shimano/Sram chains are not cross compatible and you will need to purchase the same brand as your cassette.